Each new year, Americans tell themselves they’re going to make changes to improve their lives. According to a recent YouGov poll, the top three lifestyle adjustments Americans want to make are eating healthier, exercising more and saving more money. Of course, resolutions take commitment. It’s easy to say you’re going to sock more money away in your savings account by eating out less, but how often does this happen in practice? 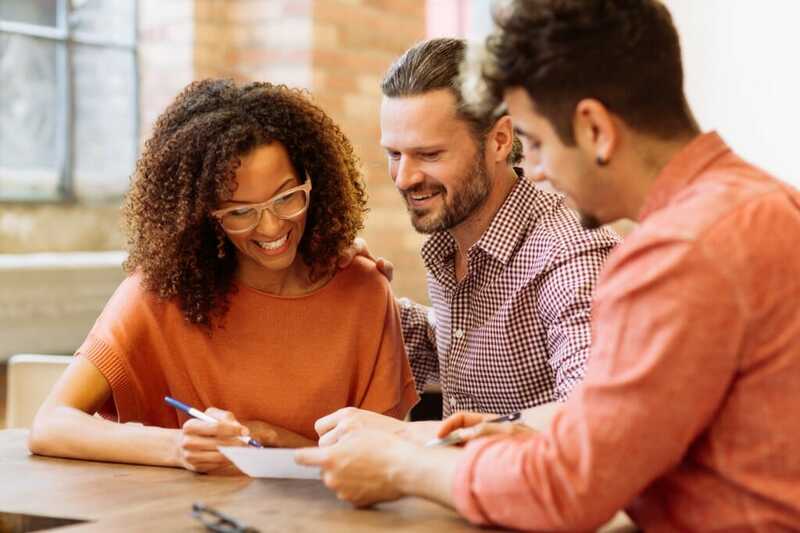 Getting better about how you manage your money takes discipline, and the residents of certain locales are better than others when it comes to ridding themselves of bad habits and giving their financial lives a boost. To identify and rank those particular places where Americans are improving their finances the most, we examined data on five factors. Specifically, we looked at the change in credit scores, credit card debt, revolving credit utilization rate, late payment rate and delinquency rate. Check out our data and methodology below to see where we got our data and how we put it together to create our final rankings. The U.S. made improvements on average The average American saw his or her credit score grow by 0.63%, according to our analysis of Experian data. Late payment rates and delinquency rates are also falling. Trouble in Texas Texas metro areas took four of the bottom five spots in this study. These metros tended to have rising rates of credit card debt, late payments and revolving credit utilization. The ideal way to use a credit card is to charge everyday purchases, rack up the reward points and pay off the balance each month. That’s how you avoid the punishingly high interest payments that come with the high APRs. Salisbury residents appear to be taking a more careful approach to using their plastic. Over the one-year period we analyzed, credit card debt here dropped by 2.26% on average, the second-highest rate in the study. That also helped reduce residents’ revolving utilization rate. The average revolving credit utilization rate dropped by nearly 1% here, the third-highest score. Taking the second spot is the Florence-Myrtle Beach, South Carolina metro area. For change in delinquency rate, which was Florence’s best score, it ranked ninth. Though that metric was its only appearance in the top 10, it also did not score poorly in any one metric in our study. 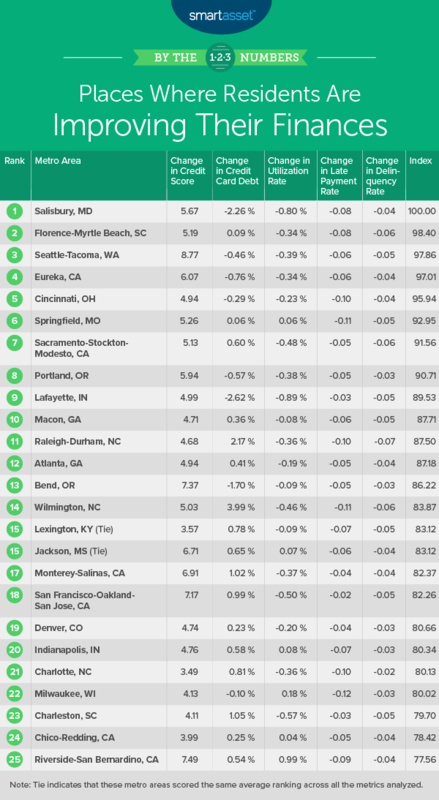 Across all our metrics, this metro area does not score worse than 30th. The Emerald City and its encompassing metro area take third. The average resident here saw his or her credit score jump by nine points, from 683 to 692. That’s one of the largest changes in the study. Seattle also ranked in the top 20 for change in credit card debt and revolving credit utilization rate. The one bad sign for Seattleites is that the late payment rate did not change much. Seattle ranked No. 67 for that metric. Whatever inspiration took hold of Eureka residents to improve their finances, the change has been dramatic. Over the period analyzed, the average credit score here jumped up six points while average credit card debt fell nearly 1%. Residents here are also using less of their available credit and doing a good job of making payments on time. Overall, Eureka ranks in the top 20 for four out of the five metrics we analyzed. The Cincinnati metro area improved its finances in every metric we tracked. Overall, it ranked no worse than 39th for any metric. Its highest scoring metrics were change in late payment rate and change in credit card debt. In both of these metrics, Cincinnati ranked in the top 20. Late payments are another curse that haunts people with poor finances. These often come with an extra charge that pushes people deeper into the red. But Springfield residents seem to be taking steps to make sure they are making their payments on time. Residents have also lowered their delinquency rate here. In both those metrics, Springfield ranks in the top 10. California’s capital is full of residents taking steps to improve their finances. Like in Springfield ranked above, delinquency rates here are falling. Sacramento-Stockton-Modesto ranked seventh for change in delinquency rate. This metro area also ranked in the top 10 for change in credit card debt. One area where California’s capital region did not improve as much is in the late payment rate. It ranked 92nd for change in late payment rate. Despite being home to some of the best beer in the country, residents here have taken a sober look at their finances and managed to make improvements. Credit scores, credit card debt and revolving credit utilization rates have all made sudden movements in the right direction. Portland residents have not done as good a job of improving their late payment rates or their delinquency rates, however. Lafayette takes the ninth spot. This metro area had the largest drop in credit card debt and the second-largest drop in revolving credit utilization rate. You might wonder why, with two top-two rankings, Lafayette finishes in ninth. Well, Lafayette ranks outside the top 20 in every other metric, including 133rd in late payment rate. Rounding out the top 10 is Macon, Georgia. Looking over the rankings one at a time, you might be surprised Macon secured a top 10 spot. It has no one metric where it scores in the top 20, though it does nab 21st for improved delinquency rate. But it also scores no worse than 65th, its ranking for change in revolving credit utilization rate. So while there are no superb scores, there are also no bad ones. As they say, there is more than one way to improve your finances, and for Macon residents, that means slow, steady improvements on all fronts. Change in credit score. This is the change in credit score from 2015 to 2016. Percent change in credit card debt. This is the percent change in credit card debt from 2015 to 2016. Change in revolving utilization rate. This is the change in the revolving utilization rate from 2015 to 2016. Change in late payment rate. This is the change in the late payment rate from 2015 to 2016. The late payment rate is the average number of late payments in a billing cycle. Change in delinquency rate. This is the change in delinquency rate from 2015 to 2016. The delinquency rate includes any financial transaction that is 90 or more days past due. Data for all metrics comes from Experian. To create our final rankings, we ranked each metro area in each metric. Then we found each metro area’s average ranking, giving an equal weight to each metric. We then used this average ranking to create our final score. The metro area with the best average ranking received a 100, while the metro area with the worst average ranking received a 0. Create a budget To make any changes to your financial status, you first need to find out where your money is going. A budget can help you do that. Once you know how you’re spending your money, you can best decide how to make changes. We recommend adjusting your budget to follow the 50/30/20 budget rules. According to the tenets of this budget strategy, you should spend 50% of your income on needs like housing and food, 30% on wants like entertainment and 20% on saving. Get expert advice When trying to juggle all your responsibilities, it is not hard to imagine how your finances might slip through the cracks. In order to make sure you are getting the best financial advice and leave no financial stone unturned, it is a good idea to hire a financial advisor. If you are not sure where to find a financial advisor, check out SmartAsset’s financial advisor matching tool. Photo credit: iStock.com/Weekend Images Inc. 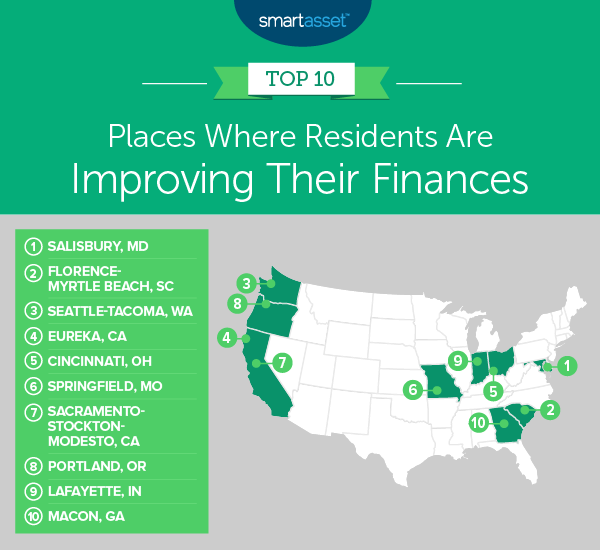 The post Places Where Residents Are Improving Their Finances the Most appeared first on SmartAsset Blog.